All Crown King homes currently listed for sale in Crown King as of 04/24/2019 are shown below. You can change the search criteria at any time by pressing the 'Change Search' button below. If you have any questions or you would like more information about any Crown King homes for sale or other Crown King real estate, please contact us and one of our knowledgeable Crown King REALTORS® would be pleased to assist you. "Enjoy an impressive view from this most impressive home. Quality & design that is hard to find. Nearly 2,600 sq ft of balcony/decks from which to enjoy the view. Completely remodeled home features gourmet kitchen,sub-zero fridge,granite counters, wood look ceramic tile through out,custom wood stairs, massive master suite with sitting area, private balcony, outdoor shower, elegant baths & loft. Rear yard features heated spa,stone patio, mature fruit trees & unbelievable views!Propane furnace & A"
"9.28 Acres of Paradise~ You will never find another home like this, nestled on a ridge with views galore. 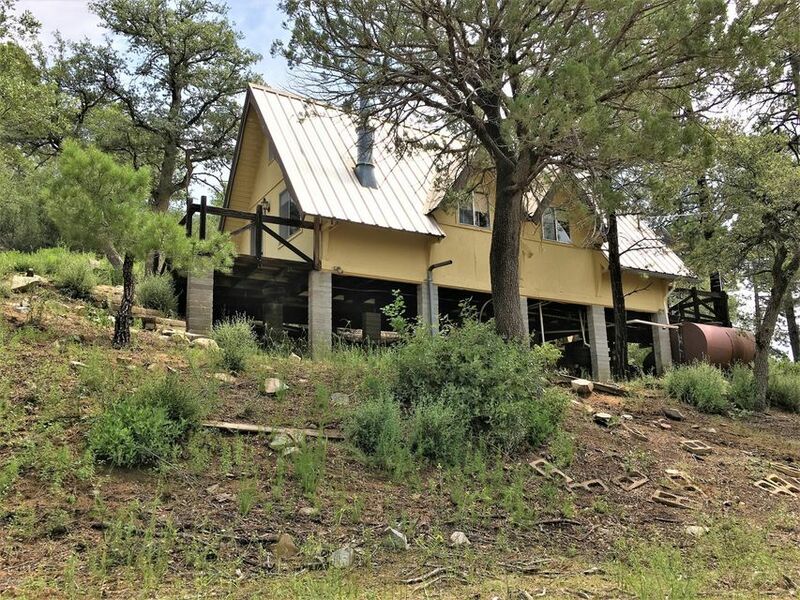 Very Secluded ranch style home on patented mining claim. Complete with private well, detached garage/workshop w/office,pond & lots of out-buildings. Second owner & it still looks new! Mineral Rights Convey w/tunnels to explore! Charming home W/EARTHSTONE Fireplace,Propane heater,Screened Porch,all appliances included. Master Bdrm is downstairs w/private bath. Kitchen is recently completely r"
"Looking for that perfect Crown King cabin? 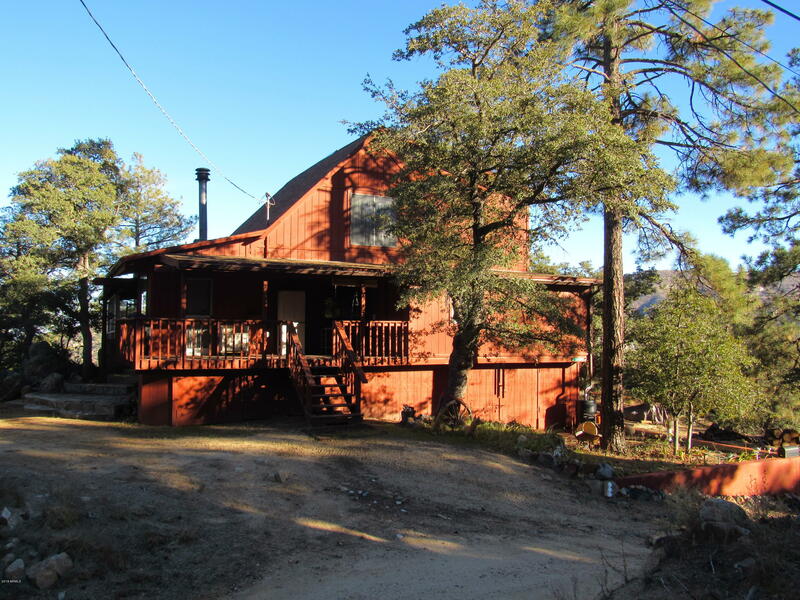 This delightful three level cabin is situated on 2 lots totaling .88 acres. 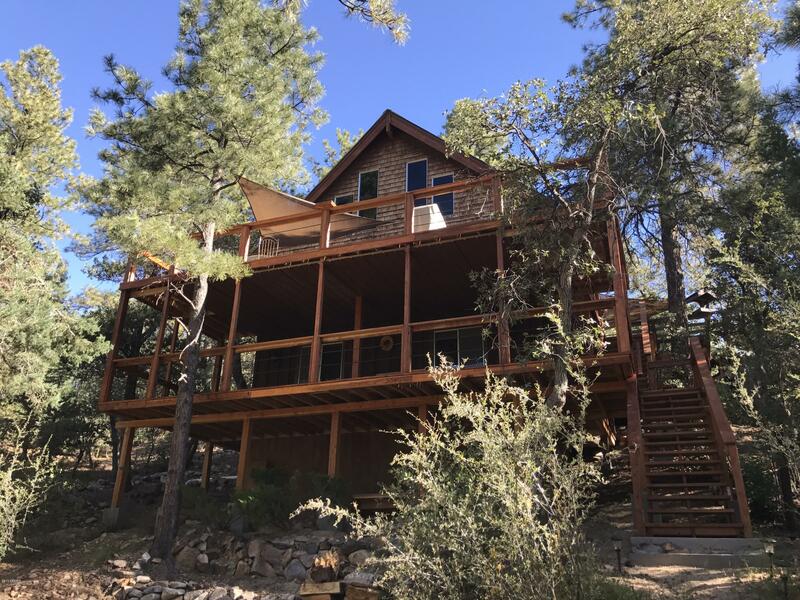 It is located on a quiet street with year round access, only a few feet from the National Forest. Home features three bedrooms and an enormous loft for extra bunking. Perfect cabin for lots of guests! Complete with baseboard heaters, massive wood stove, gorgeous wood ceilings and walls. Three large decks, giving you a perfect forest experience in any weather. Downstairs bedroom "
"Come up and see what makes this Crown King cabin so special! There are lots of surprises awaiting you in this one of a kind home. The entire upstairs is a Master Suite, complete with sitting area and elegant private bath. The wood floors throughout create a cozy charm. 2nd Bedroom has private entrance, Murphy Bed, lots of storage & more. Roomy guest bath has jaccuzi tub for relaxing! Open floor plan is prefect for entertaining. Wood stove insert in massive fireplace along with propane heaters ke"
"Escape the city up in CK to this spectacular & fully furnished cabin. Sought after Sunny South address,this split level design is more of a home with views galore,wrap around Trex covered patio, municipal water,lots of parking & nothing to do but move in! Rare block & foam construction, this home is weatherproof & maintenance free with decorative metal siding & metal roof to keep the elements out for year long enjoyment. 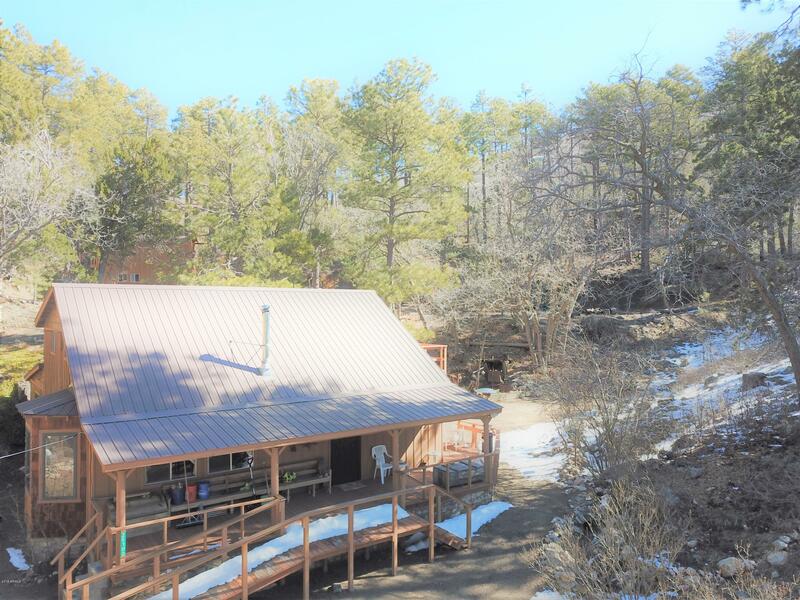 Sitting on .69 Acres,this property has privacy from neighboring cabins, a c"
"Enjoy the tall pines of Crown King in this special two bedroom cabin situated on a premium .4 acre lot. 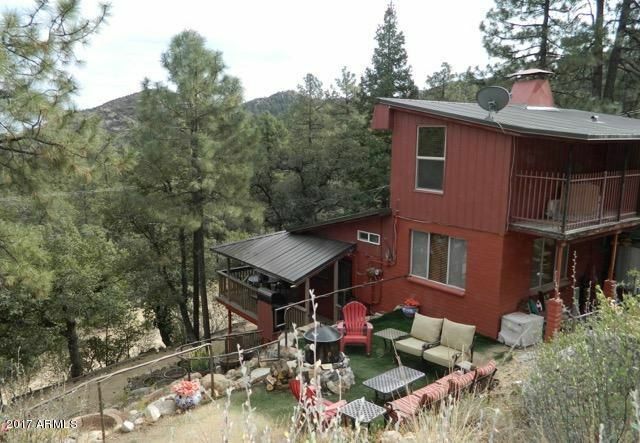 Located on a secluded street high above CK, this home offers everything you need! Open floor plan features lots of storage, large dining area, bar & cozy wood stove. Functional bath with antique claw footed tub & direct entrance to Master Brm. Second Bdrm is generous sized and Large Sun-room creates extra sleeping quarters in the summertime. Enjoy the cool weather on the wrap around porch whil"
"Prepare to be impressed! This sturdy built A Frame has it all. Situated on a hillside lot with views from three decks, this home feels as woodsy as they come. Solid oak flooring, wood beams and wood ceilings create a cozy atmosphere. The custom wood stove & Propane Furnace will keep you toasty, along with the electric floorboard heaters. There is no shortage of views from the expanded main deck. This deck will soon be your favorite place in the forest. The wall of windows invite nature inside. " 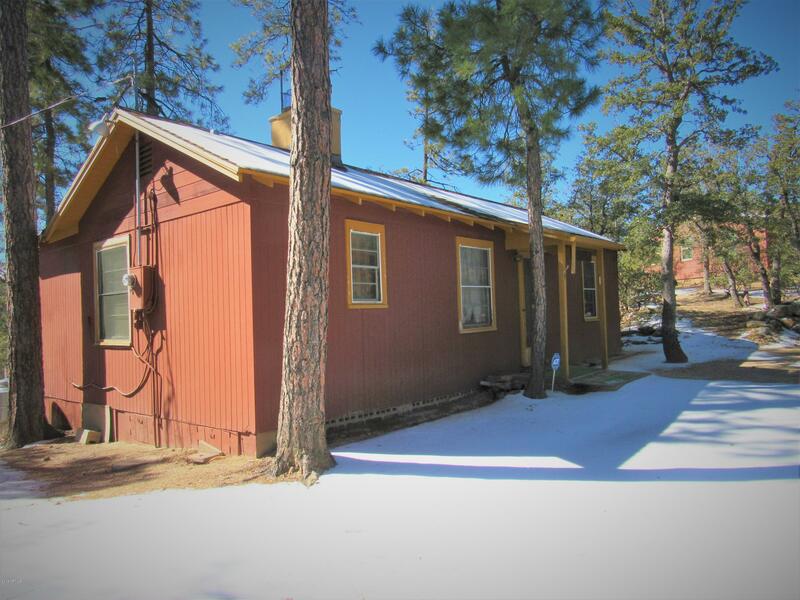 "Original owner A-Frame on two lots totaling .51 acre. This is a well built home with lots of great features. Roomy loft provides a wonderful sleeping quarters, complete with rich wood ceilings & wonderful views. Cabin features both a front and rear deck, metal roof, water capture system & compost toilet. This home has been well cared for by the original builder/owner since the 70's. Lots of parking for guests too. Extra lot provides privacy and parking as well. 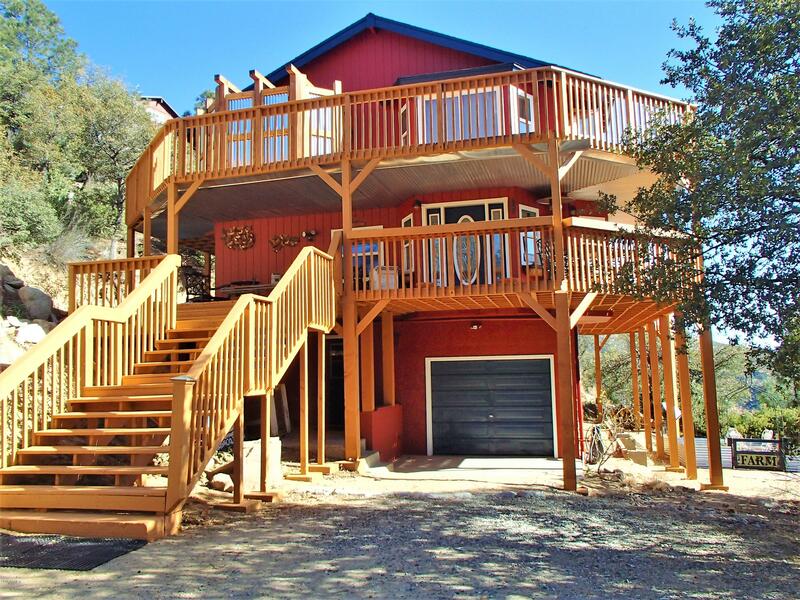 This cabin is situated in the tall"
"You will love this Tri-level cabin with views galore! 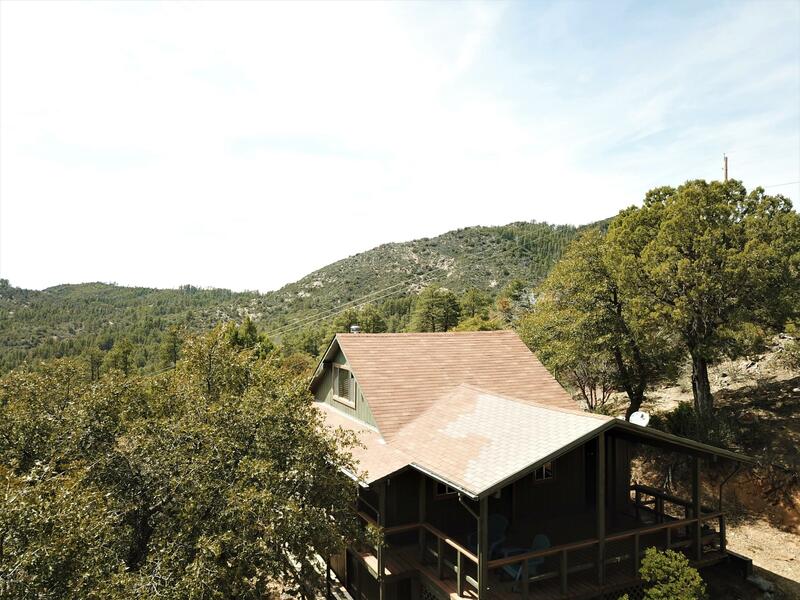 This cozy cabin is nestled high on a hill above Crown King on a .55 Acre view lot. Home features wrap around decks & lots of storage. Enjoy views in every direction! Rich wood walls & ceilings and cozy wood stove create a charming cabin feel. Master bedroom and bath on lower level. Guests sleep above the living room in a cozy loft with built in beds. Over 1/2 acre lot with circle drive and additional parking. 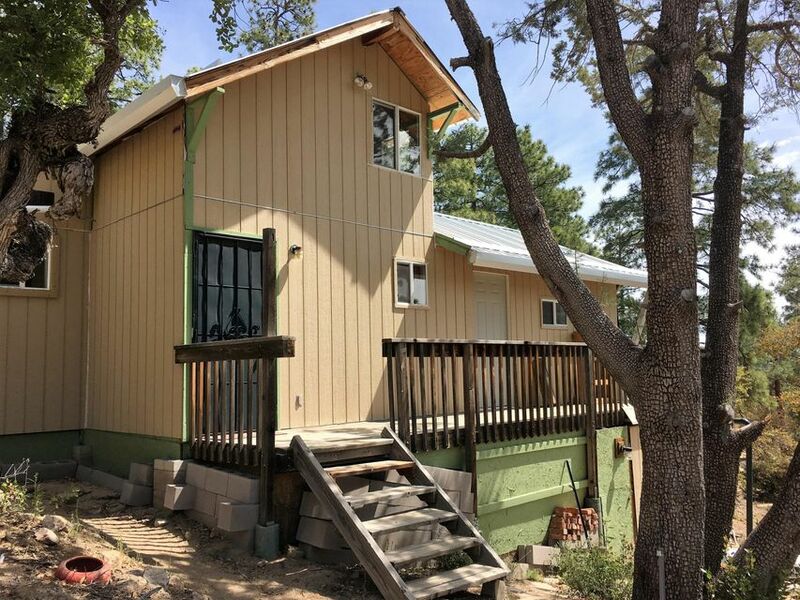 Secured storage sheds in rear, A"
"Here's you chance to own a charming little cabin in the tall pines of Crown King. The longtime owners are sad to part with this cozy cabin. Home is situated on two lots with year round access and private water company. Open floor plan makes this one feel larger than it is. Second bedroom is a roomy loft area. Cozy wood stove keeps you warm on the chilly mountain evenings. The extra lot provides privacy and extra parking area. Home features wood floors & covered front porch. Come see why the owne"
"Nearly completed cabin on two lots totalling .46 Acres. Enjoy cool summer nights and amazing views. Plenty of parking, circle drive with easy year round access. Large storage container stores quads & gear. Home has a water collection system with lots of water storage. Cozy wood stove, spacious kitchen (nearly completed), upstairs bedroom with storage inside and out.It won't take much to complete this charming little cabin. House is on .24 acres, adjacent .22 acre lot is also included. Here's you"
"Located on USFS LEASED LAND, cabins in this area pay a Use Permit which allows for private cabins on USFS property. Annual Fee Required. No year round access due to snow. Vacation Home use only! USFS restricts use as primary home. 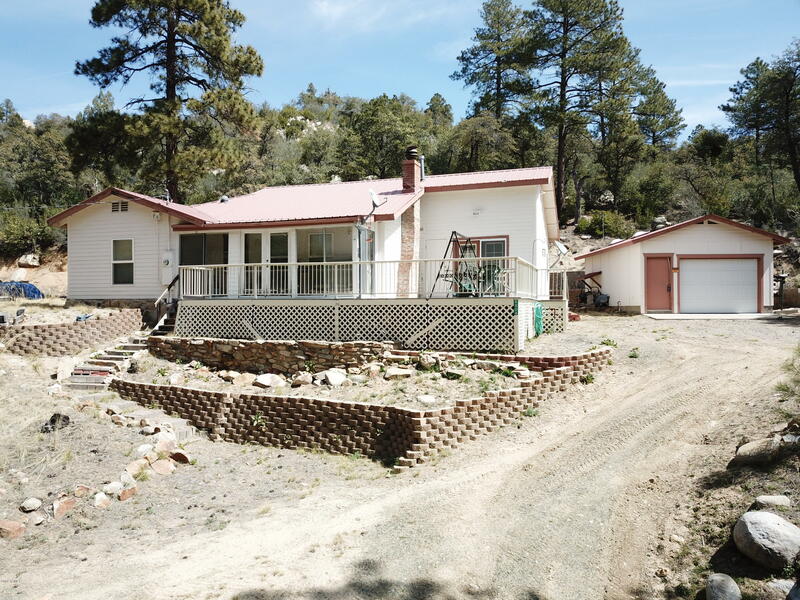 Gated community located 7 miles from the town of Crown King. 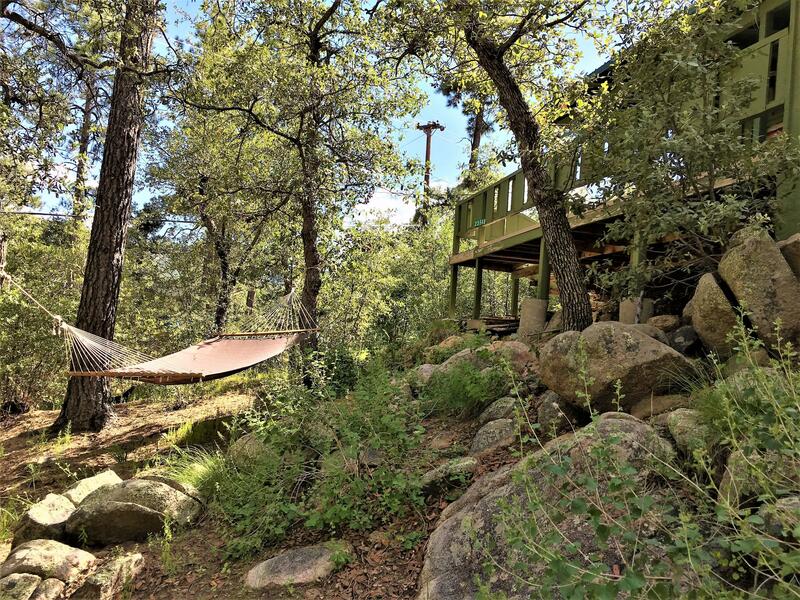 Located in the Prescott National Forest, near HTB Lake. Looking for a summer retreat that is remote and 20 degrees cooler than Phx? Look no further. 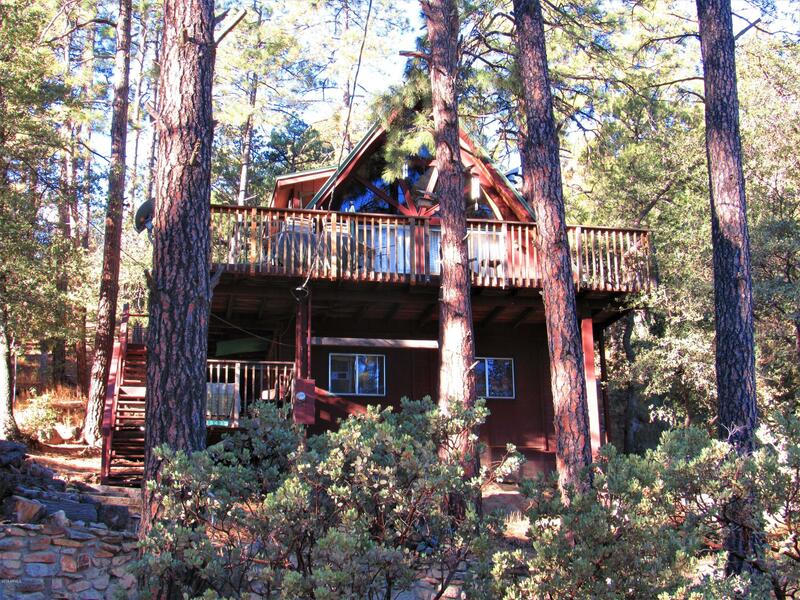 This cute cabin is nestled in the tall pines of Prescott N"